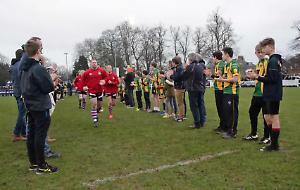 THE head coach of Henley Hawks admits he is excited at the prospect of seeing his side promoted during his first season in charge. Luke Allen has helped lift Henley into third place in the National League 2 South table off the back of seven straight wins and 20 overall from 25 games played so far. They are four points behind second-placed Canterbury, whom they visit in their next fixture on March 23. Allen, who has been in the job since May, has been saying for months that the aim was a top-five finish despite his side’s form. But now he wants his squad to keep working hard to stay in the promotion hunt for as long as possible. Allen said: “When we sat down and had a chat at the start of the season we thought that getting into the top four or five would be fantastic. “What we wanted to do, and we still do, is to consolidate ourselves as a National 2 South club and then look to build on that for next season. “It has just been about creating a positive atmosphere around the club where players want to come here to play and also to learn and improve and in doing that we have had some success, which is great. “Being honest, we did not expect to have the level of success that we have had. We knew that we had a good team with potential but the position we have now found ourselves in is exciting. Allen and his co-head coach Tom Gardner have been analysing on-pitch and training performances and focusing on the “one per cent” that could make all the difference in games. “The boys know that we are not the finished product yet,” Allen said. “They are in their infancy in terms of where we want them to be and there is still a lot of learning to do from a player and a coach point of view. If Henley does return to National League 1 for the first time since 2016, Allen says his side should look to emulate the Rams, who are top of the league with 114 points, having won 23 of their 25 games. seeing where we can make a difference. We want our boys to be big, fit and strong so they can not only get around the pitch but also boss it. Allen says he won’t be fazed if his side falls short of promotion and says he is already working on plans for next year regardless of which league they are playing in. He said: “Promotion itself, if it happens, will just be a by-product of what we are starting to build for next year. “Already we have discussed and are working on plans, in terms of being in the same league and also if we are promoted. • On Sunday, Henley Hawks Women travel to Supermarine in the Plate competition, kick-off at 2pm.